NYC ParksA rendering of the proposed Rockaway Community Park in Rockaway, Queens, New York. New York City is investing $US145 million toward protecting waterfront communities in Rockaway, Queens, a neighbourhood that still hasn’t recovered from Hurricane Sandy in 2012. The Federal Emergency Management Agency (FEMA) is granting $US120 million, and the city is contributing $US25 million toward seven projects. NYC is one of many United States cities that is starting to take storm preparation and flood resilience seriously. On the fifth anniversary of Hurricane Sandy, New York City Mayor Bill de Blasio has announced a $US145 million investment in flood-resilient infrastructure for Rockaway Beach, Queens. The goal is to protect Rockaway neighbourhoods from future coastal storms, flooding, shoreline erosion, and the effects of climate change. The funding will go toward seven projects designed to manage floodwater, the mayor’s office said in a statement on October 29. The city will contribute $US25 million, while $US120 million will come from the Federal Emergency Management Agency (FEMA). The projects include building new recreational facilities and the construction of new parks. 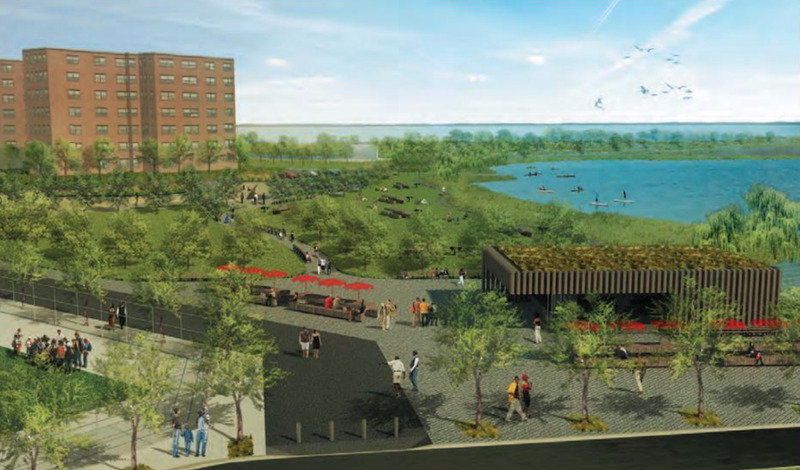 The city will also install raised banks and living shorelines (grassy areas that help absorb floodwater) along the waterfronts of the Edgemere neighbourhood and Rockaway Community Park. The final designs will still need approval from FEMA before construction. 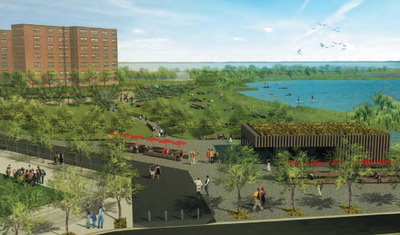 NYC ParksA rendering of the proposed Thursby Basin Park in Rockaway, Queens, New York. The Bayswater Park project will take three years to complete, and the other projects will take four to five years. There is no set timeline on when construction will start, but the city will hold a series of public meetings on the projects starting in spring 2018. New York is one of many US cities trying to guard itself from future storms. Miami, Florida, which was hit by Hurricane Irma in September, is elevating its roads, re-building its seawall, installing more pump stations, and improving its drainage systems — efforts that are part of a multimillion-dollar flood resilience plan that the city began working on in 2015. 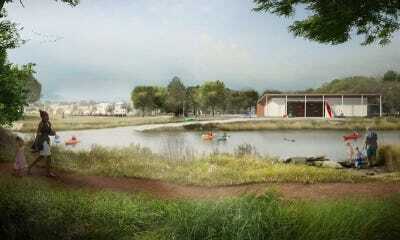 NYC ParksA rendering of the proposed Baywater Park in Rockaway, Queens, New York. In 2012, Hurricane Sandy ravaged the Rockaways, destroying over 1.5 million cubic yards of coastline and flooding homes in the area’s waterfront neighbourhoods. In 2014, the Army Corps of Engineers replenished over 3.5 million cubic yards of beach sand — enough to fill the Empire State Building twice over. But according to The New York Times, the water has already eaten away a significant amount of the new sand. Approximately 61% of Rockaway residents (or 74,800 people) still have a one-in-two chance of a major flood in their homes by 2060, according to a recent report by the Waterfront Alliance. “Five years later, it’s impossible to forget what happened, and it’s impossible to let down our guard because we learned this is a fight we’ll be fighting for a long time to make our city safe, to make it resilient,” de Blasio said at a press conference in Queens.